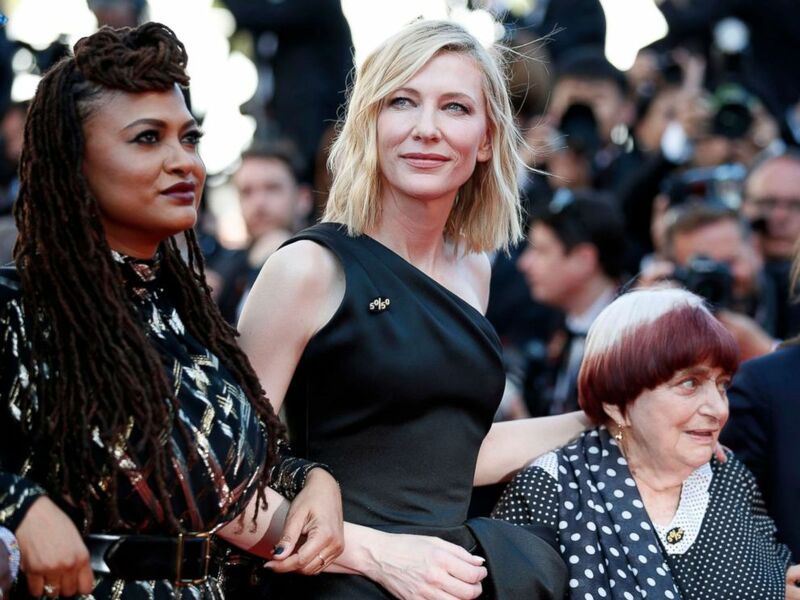 Some of the most notable women in film linked arms at the Cannes Film Festival over the weekend to bring attention to a lack of female directors at the esteemed awards and the need to redefine what it means to be "the best." Australian actress Cate Blanchett, this year's president of the Cannes Film Festival jury, led 82 women up the steps of the Palais des Festivals on Saturday for the silent protest. Actress Kristen Stewart, "Wonder Woman" director Patti Jenkins and "A Wrinkle in Time" director Ava DuVernay were among those trying to spotlight that only 82 films directed by women have been selected to compete in the seven-decade history of the festival, compared to more than 1,600 films directed by men. The official selection for this year’s festival features three films directed by women out of a total 21. Cate Blanchett, Ava DuVernay and Agnes Varda walk the red carpet in protest of the lack of female filmmakers in Cannes, France, May 12, 2018. Melissa Silverstein, a media consultant and writer who founded Women and Hollywood, a group that advocates for gender equality in the film industry, told ABC News' Brad Mielke that the disparity in the number of male- and female-directed entries came as no surprise. "That number's actually not very surprising to me," Silverstein said bluntly on ABC News' daily podcast, "Start Here." "I've been tracking the festival for almost a decade now, and, you know, it's under 15 percent per year [of festival entries that are by women] ... The fact that it's that low is an abomination, but it's consistent," she said. At a press conference on Monday, festival director Thierry Fremaux said that Cannes would look to select a higher proportion of films directed by women in future. 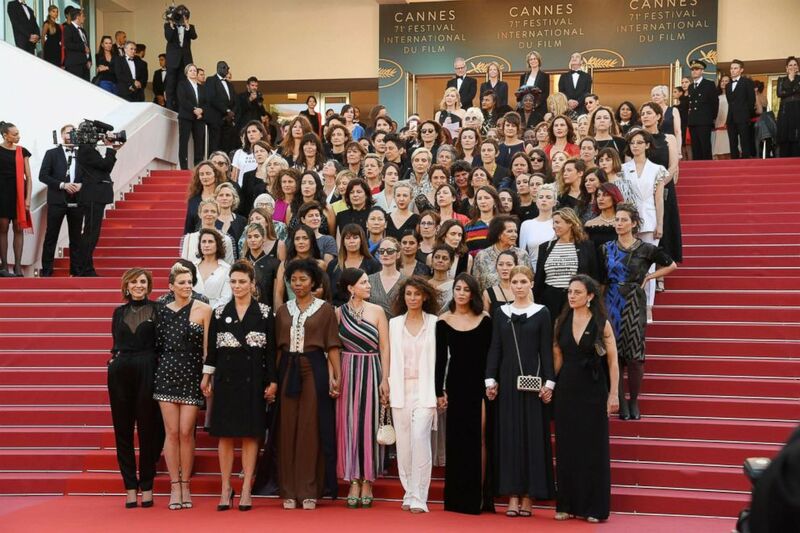 The red-carpet protest was organized by French women from a movement known as 5050 by 2020 who worked with women from Time's Up movement, according to Silverstein. "They've been working with the festival to find the right moment and action, and this is what they all decided on," Silverstein said. Festival director Thierry Fremaux said prior to the women's protest Saturday that it was a way for them "to affirm their presence." Cannes has come under increasing scrutiny in recent years over the number of female directors entered for recognition at Cannes, considered one of the most esteemed achievements in cinema. Jane Campion is the only female filmmaker to ever win Cannes' top prize, the Palme d'Or. Silverstein said the root of the problem is the subjective nature of deciding what is "best." Jury head Cate Blanchett with other filmmakers reads a statement on the steps of the red carpet in protest of the lack of female filmmakers honored throughout the history of the festival during the Cannes Film Festival, May 12, 2018 in Cannes. "I think one of the things we need to do is unpack that word because automatically in our culture when we think of the best we always think about men, so what we're trying to do is make people understand that the best doesn't mean anything anymore," she said. "The whole point is that a job should be for the best person. We get all these kind of gendered roles where the men have the priority because the narrative, albeit false narrative, has been that men sell more than women," Silverstein said. And as for larger gender issues like equal pay, Silverstein said, "I think you need to demand it ... don't undersell yourself." "If you hire more women you get more diversity and inclusion," she added. "So if we want to increase the number of women working in the business you actually have to hire them so that they [in turn] hire other people." ABC News' Brad Mielke and The Associated Press contributed to this report.